When Zelda got home from the park, Bunny Bottom Easter Cupcakes were in the kitchen waiting for her. I allowed her to climb up on the counter and she carefully selected which of the Bunny Bottom Cupcakes she wanted to eat. Two minutes later, her face was covered in green frosting. Her addiction to anything cake based is very real, we’re going to have go to cake lovers anonymous any day now. Our friends at Oriental Trading helped us out with our Easter décor this year – our favorite find was the carrot Easter eggs. Zelda was carrying around as many as she could once her cupcake was gone. Once the novelty off the carrots wore off she was staring at me and panting like a dog because she wanted more cupcakes (it’s her new thing). What’s one dessert your babes go wild for? Tell me in the comments below. This review is based strictly on my opinion. I was provided the sample free of charge by the company to provide my honest review. No other type of compensation was received. All ideas and opinions are my own. Nothing says Easter like a cute little bunny bottom! In a bowl, whisk together the butter and the coconut sugar. Using a spatula or electric mixer, combine the baking powder and slowly add in the flour, ½ a cup at a time, followed by the milk and mix together until smooth. Line a muffin pan with liners and spray with cooking spray. Pour the cake mix into each liner so that each is ¾ of the way full. While the cupcakes are baking, mix together the vanilla frosting and 2-3 drops of food coloring. Place a piece of parchment paper on the counter and pour the corn syrup and the white pearls into two separate small bowls. Use a brush to apply a light but thorough layer of corn syrup to a mini marshmallow and then dip into the white pearl sprinkles until coated. Use a toothpick to remove any excess sprinkles and place on the parchment paper to dry (this is the bunny tail). Repeat this with each mini marshmallow. Cut the large marshmallows widthwise with scissors (approximately 1/8 inch thick). Arrange three of the pink jimmies sprinkles at the top (these are the claws) and three pearl candies at the bottom (these are the paw pads). Cut the top off a regular sized marshmallow and frost the cupcake. Place the cut marshmallow on top of the cupcake (with the cut side down). Brush the top center lightly with corn syrup and secure the tail. 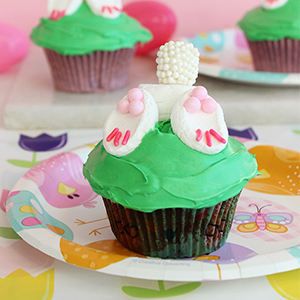 Place the feet on top of the cupcake so they lean on the large marshmallow. Repeat steps 12 & 13 until the cupcakes are all decorated. Serve to littles for a special Easter treat!